JDK Legal Services is a boutique personal injury and commercial law practice. We have a reputation for providing ethical, high quality legal services and access to justice for all of our clients. Our lawyers are highly skilled and accessible. Our size enables our Directors to give personal attention to every matter. When you call, we ensure you speak to a lawyer for preliminary advice. If we think we can assist you, we will arrange an initial consultation. Our success is built on the calibre of our people, our dedication to our clients’ best interests and a genuine desire to help people who find themselves in difficult situations. June incorporated JDK Legal Services Pty Ltd and commenced offering legal services at JDK Legal Services on 1 July 2016. 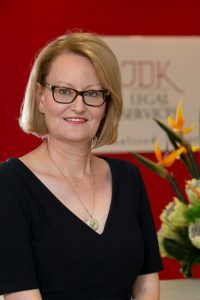 June commenced her law degree as a mature age student in 1996 and during her law degree she was awarded the John Koowarta Scholarship and won the Commercial Law Prize. June was admitted to practice in the Supreme Court of Western Australia on 2 March 2001. Since admission June has focused on the areas of commercial law and commercial litigation. 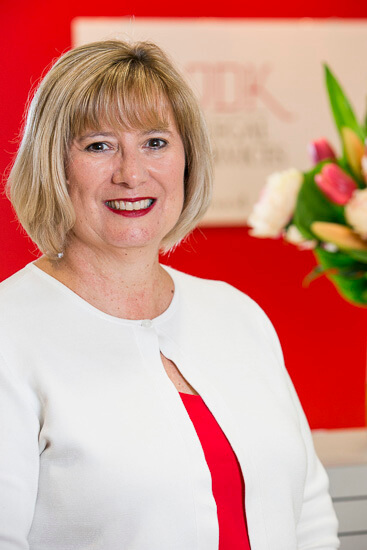 In February 2000 June joined Dwyer Durack, where she initially worked in commercial law and then widened her area of practice to include commercial litigation. She was the Managing Director from July 2010 to January 2016 and headed up the General Litigation and Commercial Law department. 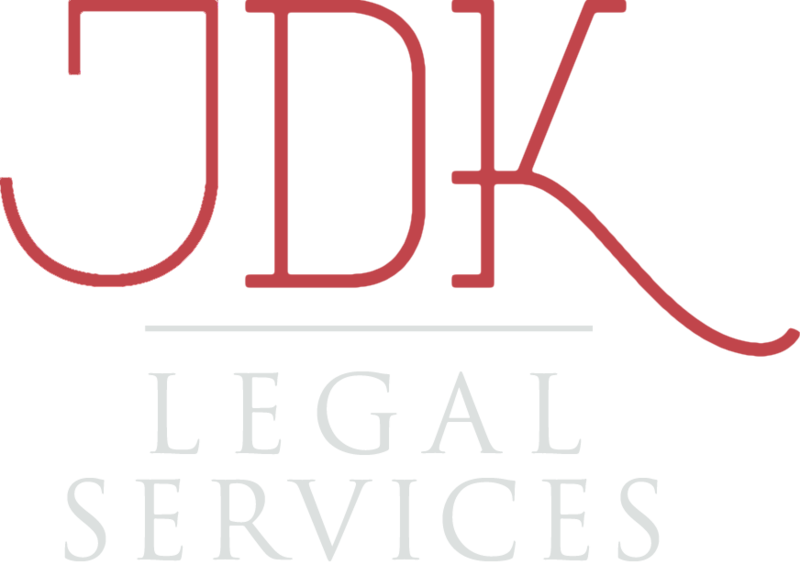 June brings to JDK Legal Services the values and experience of this reputable firm. June has experience in drafting commercial documents and advising in relation to all aspects of business law whether you are a start-up business or you have been operating for years including litigated matters. In addition, June has many years’ experience in advising trustees of charitable trusts. June Kenny is a member of the Australian Institute of Company Directors (“AICD”) and has graduated from the AICD’s Company Directors Course. June is also a member of the Law Society of Western Australia, the Western Suburbs Business Association and the Australasian Legal Practice Management Association. Kate is the Director of the firm’s personal injury department. Every personal injury matter is overseen by Kate and managed with the assistance of one other lawyer. Initial appointments are obligation free and provide frank and practical advice. It has always been important to Kate to establish a strong, positive relationship with clients from the outset in order to help them feel supported throughout the duration of their case. Kate has worked exclusively in the area of personal injury law since 2006. She has successfully recovered compensation for people injured in motor vehicle accidents, public liability accidents and for relatives of people involved in fatal accidents, although her primary area of interest and expertise is in work accidents. Kate is committed to working with clients to obtain fair compensation in a timely and cost efficient manner. Much of her work is obtained on the recommendation of satisfied clients or through referrals from other members of the legal and medical professions who recognise her expertise. 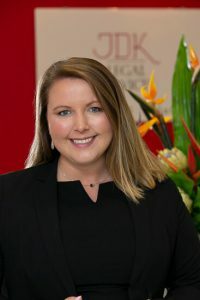 In 2016 and 2017 Doyle’s Guide to the Australian Legal Profession listed Kate as a recommended lawyer in the areas of workers’ compensation and motor vehicle accident compensation. In 2018 Doyles Guide to the Australian Legal profession listed Kate as a recommended lawyer in the areas of workers’ compensation, motor vehicle and public liability claims. Kate is a member of the Law Society of Western Australia. Rebecca joined JDK Legal Services in 2016 and predominantly handles claims relating to workers’ compensation and motor vehicle accidents. 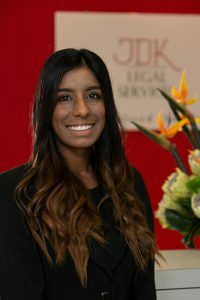 Her experience in other aspects of personal injury such as criminal injuries compensation, fatal accidents, medical negligence and public liability matters make her a valuable member of the JDK Legal Services team and a well-respected member of the profession. Rebecca is committed to providing practical and easy to understand advice to her clients. She has represented clients at WorkCover, the Administrative Appeals Tribunal and the District Court of Western Australia. Having graduated in 2013, Rebecca is admitted to practice in the Supreme Court of Western Australia and the Federal Court of Australia. She is also a member of the Law Society of Western Australia. Joseph joined JDK Legal Services as a junior lawyer in the Personal Injuries Department in October 2017. 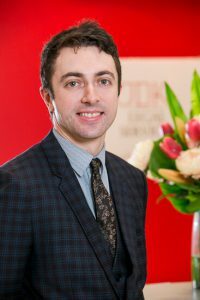 Joseph studied a Bachelor of Law and Bachelor of Arts double degree at the University of Western Australia, graduating in August 2016. He then completed his practical legal training with the College of Law before being admitted to practice law in Western Australia in September 2017. Prior to being admitted Joseph obtained legal experience volunteering in criminal law, family law, and administrative law. Joseph also volunteered at the Mental Health Law Centre for a year, providing paralegal assistance for clients with a mental health diagnosis. Joseph is dedicated to providing timely professional advice and guidance to JDK Legal Services’ clients through their often distressing and complex legal matters. In his free time Joseph is an amateur magician, enjoys organising board game nights with friends, and rock-climbing. Alexandra works predominantly in the area of workers’ compensation and is a Registered Agent. She graduated in Law at the University of Notre Dame in Fremantle in 2018 and also has a Bachelor in Communications and Media (with a double Major in Politics & International Relations and Film Production). She is currently completing her Practical Legal Training through the Piddington Justice Project. Alexandra’s background is in employment, industrial relations and politics and this led her to pursue a career in law. Alexandra has a passion for helping people and likes to be an active part of her community. Alexandra is a co-founder of Flaktest Gaming, a platform which localises the global esports phenomenon and provides a safe online gaming environment for students in Australia and Indonesia. Alexandra likes Pilates or swimming before work; and a nice glass of wine after work. 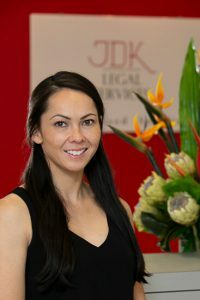 Alexandra is a member of the Law Society of WA and the UN Women National Committee Australia. 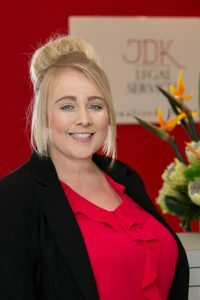 Kristy joined JDK Legal Services in June 2018 as the Accounts/Office Manager. She has worked in the legal industry in medium sized, multi-disciplined law firms for over 20 years with 17 years of that time as an Office Manager which also incorporated the role of accounts. Kristy is enthusiastic, positive and thorough in everything she does and is great at multi-tasking. 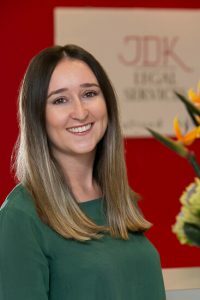 Meagan joined JDK Legal Services in October 2017. Meagan works as a paralegal assisting Kate Dempster and Rebecca Harrison in all aspects of personal injury claims. She is enthusiastic, positive and aims to succeed in everything she does. Meagan completed her Bachelor of Communications and Media with a major in journalism which provides her with a great foundation to undertake her role at JDK Legal Services. Meagan lived in Singapore for two years which has broadened her outlook on life, has worked in many jobs ranging from hospitality to forklift driving. Her background has led her to be very adaptable and open minded. Tessa joined JDK Legal Services in January 2019 and works as a Legal Assistant. Tessa is studying law at Murdoch University and has had a previous professional background in Nursing and Occupational Therapy. 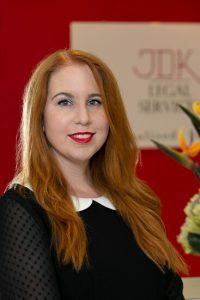 She brings to JDK Legal Services a love of working with people and a diligent and resourceful attitude. No problem is too difficult – Tessa looks forward to making your journey with JDK Legal Services as smooth as possible. Nicolette joined JDK Legal Services in March 2019 as a Law Clerk. She is currently studying a Bachelor of Law at Murdoch University and she has previously graduated from The University of Notre Dame with a Bachelor of Preventive Health with a specialistion in Sport Science. Nicolette is passionate about helping people. Giulio commenced working in the area of personal injury law in 1991 and brings to JDK Legal Services a vast amount of experience working for plaintiff law firms and insurance companies. He has an impressive track record of successfully representing injured workers at WorkCover and is well known for his professional approach and his ability to provide advice to clients in plain English. Since 2011, Giulio has been working as an Independent Registered Agent and exclusively represents injured workers in relation to their workers’ compensation claims. 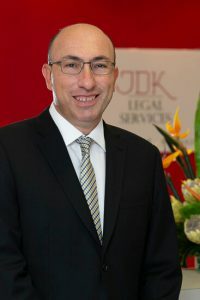 A core part of his business involves working with JDK Legal Services and he regularly appears at WorkCover in both the Conciliation and Arbitration Services. He is most proud of the fact that his relationship with JDK Legal Services enables him to deliver a specialised service to JDK Legal Services’ clients which has resulted in excellent outcomes at often difficult times in their lives.